KINGSTON – Queen’s University School of Medicine announced today that it will play a leading role in the Royal College of Physicians and Surgeons of Canada’s Competence by Design medical education program. As of July 2017, all incoming Queen’s residents will start their training using a Competency Based Medical Education (CBME) model. The CBME model shifts the emphasis of training from one focused on time-based learning and measurement to one based on competency at the skills required. Instead of requiring residents to complete a pre-determined period of time at one level before moving on to the next, they will instead be promoted once they have demonstrated competency in a particular field. The CBME training model also calls for more frequent and meaningful assessments, ensuring that competent residents will move through training in a more individualized and efficient manner, saving valuable resources and promoting excellence in their paths to independent practice. The Royal College mapped out a multi-year transition for all residency programs in Canada in 2014. 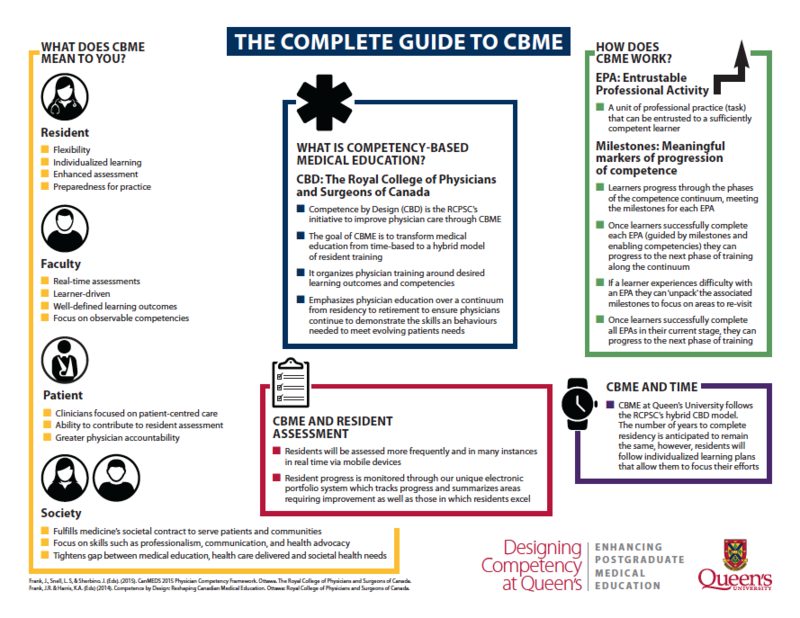 However, in consultation with the Royal College, Queen’s University’s School of Medicine took on a leadership role by designing and implementing a parallel accelerated path to CBME, making a commitment that all incoming Queen’s residents will start their training using a CBME-based model by July 2017. The university’s application to accelerate the transition was approved by the Royal College this past November. “Here at Queen’s we have the extraordinary educational leadership to accomplish this, in addition to an incredibly dedicated teaching faculty who are universally committed to the best education for our residents. We all share the same goal, and that is to graduate specialists who are more skilled and more knowledgeable than we might have ever imagined. That’s our goal, and that is why I am so excited about our CBME initiative,” says Dr. Reznick. Available to all CBME stakeholders. The CBME Resident Lead is the resident who will help guide the transition and implementation process for competency-based medical education (CBME) at the program level. Each RCPSC and CFPC program at Queen’s will have a CBME Resident Lead. The CBME Resident Lead will, in collaboration with the Program Director and CBME Program Lead, ensure resident interests are represented throughout all aspects of CBME implementation in addition to helping ensure all aspects of CBME implementation are carried out within the program. This position will be allotted academic protected time. The CBME Resident Lead must be a resident currently enrolled at Queen’s University and have demonstrated an interested in education and administration. The candidate must have strong organizational, communication and leadership skills, and a solid foundational knowledge of CBME principles. The position must have a defined Department/Division job description that is associated with adequate academic protected time and appropriate administrative support. This protected time will ensure the CBME Resident Lead may attend all CBME related meeting attended by the program director and/or CBME Program Lead, in addition to attending CBME Resident Subcommittee Meetings and the International Conference on Residency Education and/or International Resident Leadership Summit. The CBME Resident Lead will work collaboratively with their program’s director and CBME Program Lead. The CBME Resident Lead will have a permanent position on the program’s postgraduate committee, in addition to those positions currently held by residents. The CBME Resident Lead will also work closely with the CBME Resident subcommittee to ensure cross-specialty communication on CBME at the resident level. The CBME Resident Leads will be selected by the Program Director and CBME Program Lead. It is the expectation that this position will be re-evaluated once CBME is fully implemented across Postgraduate Medical Education in 2022. Consideration will be given at that time whether these positions should be named Postgraduate Education Resident Lead, in an effort to keep residents actively and formally engaged in the process of evidence-based medical education. The CBME Resident Subcommittee’s mandate is to represent the interests of the greater resident body at Queen’s School of Medicine through the transition and continued integration of the competency based medical curriculum at the PGME level. The CBME Resident Subcommittee was established to provide a forum for discussion and advocacy around resident issues in anticipation of the transition and implementation of a competency based curriculum at the postgraduate level. The group will provide support to the CBME executive team in developing effective and transparent communication strategies to inform current and incoming residents of CBME expectations and updates. The group will communicate closely with the Resident Doctors of Canada and the Professional Association of Residents of Ontario about regarding CBME implementation at Queen’s, and represent the interest of residents at the hospital, provincial, and national levels during the CBME transition at Queen’s. Co-Chairs: Dr. Jena Hall, PGY2 Obstetrics and Gynaecology & Dr. Damon Dagnone, CBME Faculty Lead. For all of our Distributed Medical Education faculty, please read the attached brochure on how to get started with CBME for your residents.